When and how did you first become interested in translations? That’s a difficult question for me because I think I’ve always been interested in them. I grew up in a bilingual neighborhood in Cleveland and my household was bilingual–Italian and English. In graduate school, I developed a number of friendships with students of German. And then finally, I started reading the poetry of Paul Celan intensely—approximately eight years ago. I realized rather quickly that I would be missing something if I didn’t also read the original German versions of his poetry. Many observers have stated that his use of German is ironic as he was Romanian, and German was, at least for him, the “language of the oppressors” – something quite significant in the minds of those who observe this. Since that time, I’ve also become deeply interested in translation theory and practice, which is, as it turns out, quite a complex set of ideas and debates that are ongoing. I feel that I am in the middle of that maelstrom now. But I also find it a deeply pleasurable place to be. 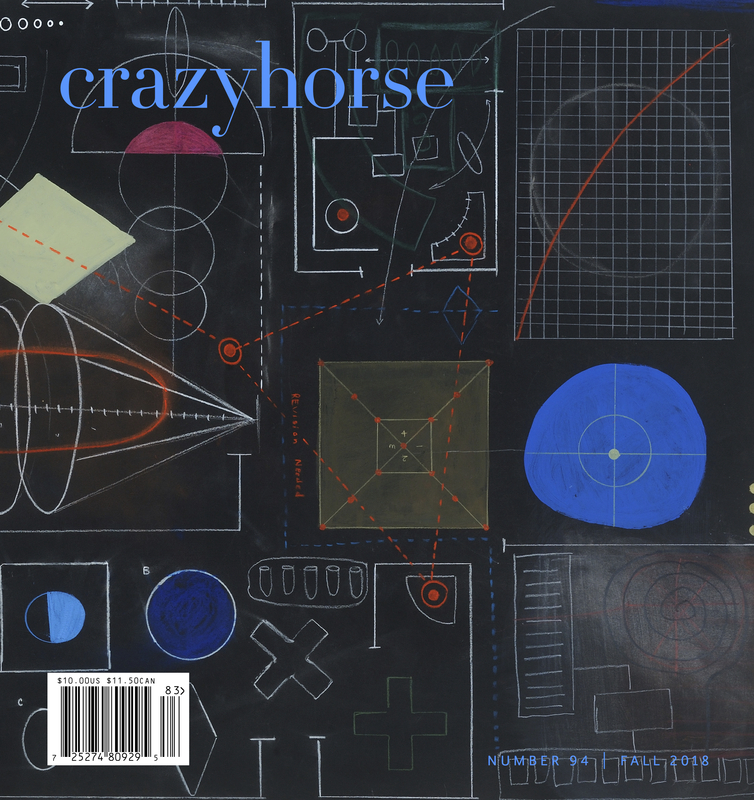 As the poetry translations editor for Crazyhorse, what would you say you’re looking for in a submission? What do you want to include in the journal? What do you want to see in a work? Those too are difficult questions to answer. For me, I guess the idea is to observe carefully what kind of art I have in front of me. As we all know poetry comes in many different styles, designs, subject matters, approaches, and so on. One is always looking for literary art that rises above the surface of the page: something that stands out for any of a variety of reasons; something that registers with the reader as awe, inspiration, sympathy, surprise, admiration. There’s a hypothesis in visual arts referred to as “the gesture.” Nature photographer Ansel Adams would sometimes sit next to his camera all day waiting for the world to make “a gesture.” Then he would simply open the lens and take the shot, the picture. The world would “show itself” to him as something acutely alive in that moment. That’s how he made his art. I think poets try to do the same thing with words. We wait before the blank page of the mind or the heart for something similar and then try to recognize it when we see it. When we are successful at that, even an average reader will tend to notice it. That’s what I’m looking for. We might call it, in a way, life inside the poem. As regards translation itself, if I am familiar with the language of the original version of the poem, I also look for some consistency in the two versions or some reason to believe the translation is crafted well. If I’m not familiar with the language of the poem but I find it interesting, I will ask a friend who is fluent in that language what she or he thinks and why. Then I can take a more informed position with regard to the poem. I think we want to include in the journal any version of excellence that we see. We always hope for something remarkable, and we look for this. We are also interested in a well-crafted translation, while at the same time recognizing that skilled and informed people may at times disagree about a definition for that phrase. One of my friends is Swedish linguist, Professor Goran Malmqvist, a member of The Swedish Academy. Goran is Sweden’s foremost sinologist and a brilliant linguist and translator. I believe his translations of his friend Tomas Transtromer’s poems are the best I have ever seen. Goran has a deep knowledge of the intricacies of translation, its difficulties and hard choices, as well as how it may be done skillfully (or less so). Yet he once wrote to me of his own translation practice (Swedish into English) that he “just choose[s] the word that sounds best” and uses it. Skill in translation is not easy to measure with certainty; it is always an imperfect craft. We are looking for a great poem, translated with some accuracy and some poetic sympathy or skill and, at need, adapted or changed in a reasonable way. I guess by “reasonable” I mean staying as close as possible to the literal phrasing and doing the best we can with idiom and rhyme, and other troubling elements (like humor, for example). But in the end, the translation must work in the new language, i.e. it must appeal there as well and capture much of its original design and art. Lastly, we keep an eye on providing some variety for our readers—different languages, as well as some variation in styles and approaches. It’s great if every issue’s translations can be excellent and distinct. In answer to your last question, I want to see a poem that knocks me off my feet in both skill and art, or one that makes me weep or laugh out loud. If it makes me think deeply, that’s good too. What advice would you give to writers working with translations? What should they focus on most for a translation? Editors of translation should always be translators themselves, even in a modest way. Also, my guitar teacher taught me many years ago that if I wanted to get better, I had to play with as many different people as possible. If we want to understand translation, we should talk to everyone we might know who is doing it. We should make it a passionate study, something we engage in because we love it. Robin Fulton MacPherson, a well-known Scottish poet and prolific translator of Swedish verse who lives in Norway, is a pen pal of mine. I will not hesitate to email him a question from time to time when I am, say, working on a conference paper regarding translation. I might do the same with Goran Malmqvist. And I have two very good friends near me in the States with whom I sometimes translate poems by German writer Georg Trakl. I will often email them or meet up, even when I am working on my own in translating a poem. Not long ago, I wrote to my German colleague at Ohio University, historian Ingo Traushcweizer, to ask his opinion about a German idiomatic phrase I was having great difficulty with. We go to extremes to understand what we are doing. In a perfect world, translation and editing translation should be done by someone who is fluent in both languages. If this is not the case, however, it is acceptable to use a fluent speaker/reader as a co-translator, though the person doing the translation must have some familiarity with the language undergoing translation and, of course, also be quite humble about what she/he does not know. Ingo made this recent translation possible for me, for example. I did most of the work, but without him one line would have been so far off, the translation would have been useless. That same poem was helped further with some criticism from two other friends, philosopher Jeff Powell of Marshall University and Eric Miller, an independent scholar and Germanist from Athens, Ohio. Perhaps this is a reasonable snapshot of how the process of translating works sometimes. When someone questions a bit of translation we are working on, we need to be ready to accept helpful criticism and/or defend our choices. I’ve noticed one of your areas of focus is Swedish translation. What specifically about Swedish poetry draws your interest? Well, I absolutely love Tomas Transtromer’s magical poems and the work of my friend poet Ingela Strandberg, who recently won the equivalent in her country of The Pulitzer Prize. Professor Malmqvist is the reason I became involved in Swedish poetry, and he remains a great inspiration to me. I have read much of his own writing as well, a superb collection of works in its own right. The thing one notices in poems by Transtromer, Strandberg, Kjell Espmark, and others is how the landscape of Sweden—an absolutely remarkable geography characterized by an amazing quality of sunlight there, for example—infuses itself into descriptions. This is a country that Americans would find very magical, and it comes through in the writing. But beyond this, in the same way that the Swedes have been leaders in certain technologies—automobiles, audio electronics—we find that they are very intelligent artists, both facile and deep at the same time. There is a magic I find in their verse that comes both from a quality of mind and from a remarkable cultural and geographic or geological experience. Europeans, I have noticed, and I am merely stating an opinion here, seem more daring than many North American literary artists. They risk more and achieve something often, though not always, beyond us. Their history is older than ours, and their sense of art seems quite advanced to me. There is a lot to consider and enjoy in a great Swedish poem, a broad spectrum of possibilities that I find very appealing, even compelling. You’ve published two books of poetry so far and are currently working on a third. How would you characterize this third book? In what ways are they similar or different from The Palace of Reasons and The Body’s Fire? Go to Hell! he knew he had to do it. so what’s the point of refusing. He didn’t have to go quickly though. He could take his time. This sort of word-play and fooling around is something I was after. I wanted to take catastrophe and make a humorous moment out of its material. But, of course, this is mythical catastrophe and therefore a stand-in for personal or psychic cataclysm—something, unfortunately, too many of us face. I was also interested in putting as much magic in the book as possible. When asked about his own motivations in an interview, Charles Simic famously said, “Give us our daily portion of the miraculous!” I am sincerely hoping for that too.